Here's yet another balsamic-strawberry recipe. Sorry not sorry. It's such a versatile combo because it can pretty much be used in any course: appetizers (strawberry-balsamic bruschetta or flatbread), side dish (strawberry-balsamic caprese salad), dessert (strawberry-balsamic ice cream. Or cupcakes), and now here it is as a main dish. Pork tenderloin pairs really well with fruit. 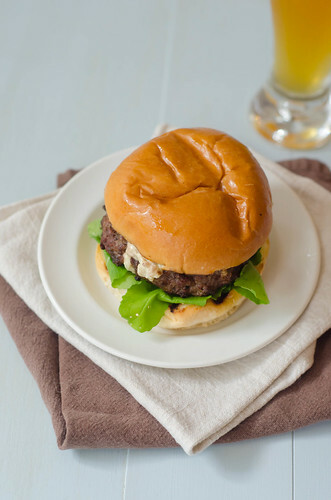 The mildness of the pork can pretty much take on any flavor combo, and fruit brings out a subtle sweetness. This pork tenderloin is seared on the stovetop, then finished in the oven. This allows you to get a nice char on the outside, but keeps it nice and moist throughout. It's a lean cut of meat, so it's definitely prone to being dry and overcooked, but the sear-roast method works really well here (incidentally, this is also a great way to cook chicken breasts). After the pork is cooked, as it rests you make a quick strawberry-balsamic pan sauce with the drippings and browned bits on the bottom of the pan. Browned bits = frond = flavor. It's a very simple and versatile method, and the sear-roast-pan sauce M.O. is what I do most often when I'm cooking pork tenderloin. 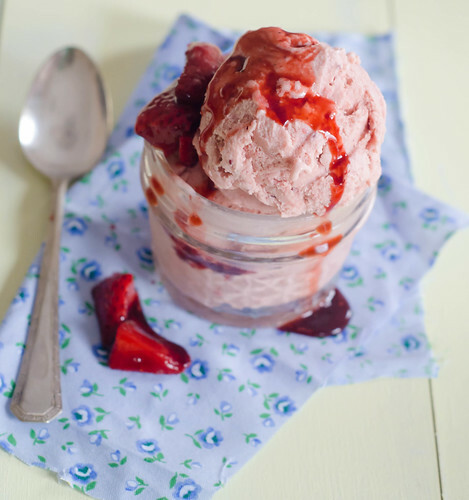 The sauce is a simple combination of strawberries, strawberry preserves, and balsamic vinegar. A little shallot, garlic, and crushed red pepper help balance out the sweetness. Half of the strawberries are pan-roasted, and they kind of "melt" into the sauce. The remaining ones are added at the end, to keep some bright freshness and texture to the sauce. 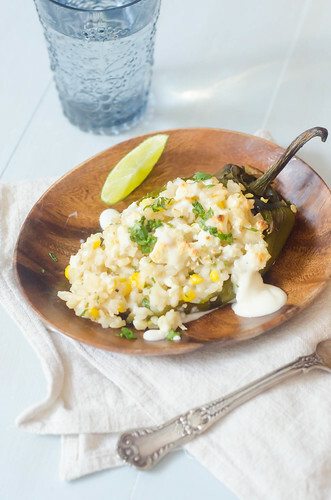 We loved this dinner, and while it seems impressive and fancy, it was so quick and easy. I roasted some asparagus alongside the pork, and served a baguette on the side. 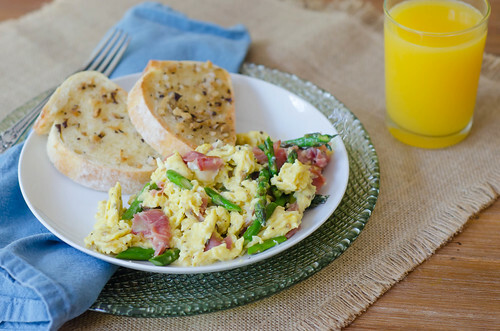 It was a lovely meal, and one that I'll definitely keep in my repertoire for easy spring and summer entertaining. Preheat the oven to 450. Generously season the pork with salt and pepper, and sprinkle with the Herbes de Provence. Heat 1 tablespoon of the oil in a large ovenproof skillet over medium-high heat. Add the pork. Brown on all sides, about 7 minutes total. Transfer to the oven and bake until an instant-read thermometer reads 140, about 8-12 minutes. Remove from the oven, transfer the pork to a cutting board, and cover it loosely with foil. Allow the pork to rest at least 5-10 minutes. Return the now-empty skillet to the stovetop see to medium heat. Add the remaining tablespoon of olive oil, and sauté the shallots and garlic for 1-2 minutes. Add the vinegar, strawberry preserves, and half the strawberries, and bring to a boil. Boil about 3-4 minutes, until the vinegar has reduced and thickened. Remove from heat and stir in the remaining strawberries and the red pepper flakes. Season to taste with salt and pepper. 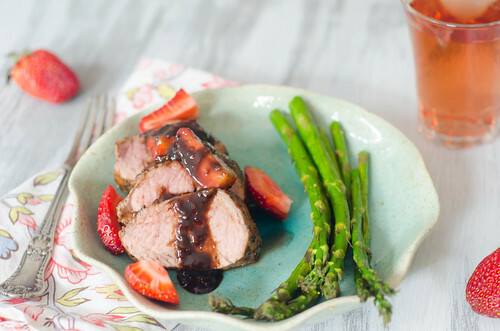 To serve, slice the pork tenderloin and top with the balsamic-strawberry sauce. I am all about fun summer cocktails. Is there anything more relaxing than sitting on the back porch, watching the sun set, and sipping a cocktail? I already think of sangria as a summery drink, but when it's in slushy form? And full of strawberries, blackberries, blueberries, and raspberries? Epitome of a summer drink, right here. 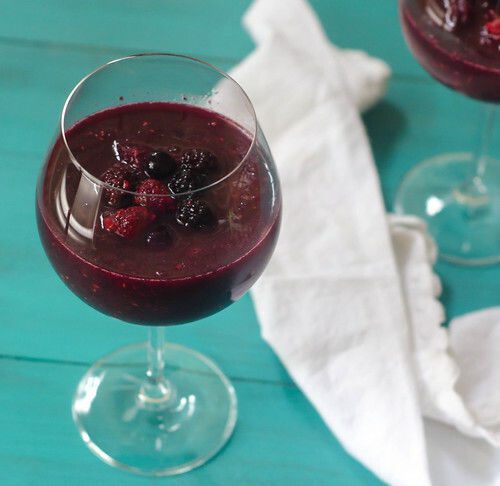 The berries, wine, liqueur, and juice are blended, then the mixture is frozen using your ice cream maker - such a revelation! I'm already imagining the endless possibilities of adult slushies - rum and cherry coke anyone? Feel free to play around with the fruits and flavor profiles here - I think a peach and white wine version would be absolutely delicious! After the scary thunderstorms we had last night, we're gearing up for an absolutely gorgeous weekend here in Atlanta - I hope everyone has a wonderful weekend, and Happy Father's Day to all the dads, grandpas, and father-figures out there! Combine all the ingredients in a blender and puree until smooth. Transfer to an ice cream maker and churn until a "slushy" consistency is reached. Divide among serving glasses and drink immediately! This year we joined a CSA, and I'm very much looking forward to having fresh veggies all summer long - veggies that are grown less than 3 miles from my house, no less! Being that our spring and summer got a late start here in Atlanta, right now we're getting a lot of greens, root vegetables, and lettuce. And while I love all of those things, they aren't Joey's favorites, so I have to get creative when it comes to dinner. This pizza is a really great use of kale. I actually ate it for the first time last year when I attended a food photography workshop in Charleston. I really loved it, and therefore was super excited when Annie recreated it last year. 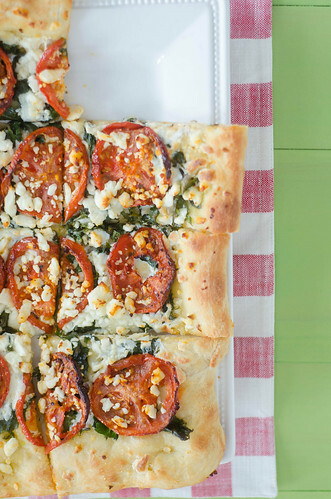 Roasted tomatoes are one of my favorite things ever, and combined with salty, briny feta and the kale, this pizza is near the top of my 'favorites' list. With summer tomatoes jusssst barely beginning to come into season, this is a great way to get your fix - if you've been jonesing for them, that is. They are slow-roasted in the oven, so even less than stellar tomatoes come out tasting pretty fantastic. Joey and Caroline both loved this pizza as well, and I know that it will be making a repeat appearance soon, what with all the kale we have showing up. And finally, as an aside, is there any interest in a CSA series? Maybe a chronicle of what we receive in ours and recipe ideas, suggestions, or links? To roast the tomatoes, preheat the oven to 300˚ F and line a baking sheet with parchment paper. Slice the tomatoes into about ½-inch thick slices. Arrange the slice in a single layer on the prepared baking sheet, and drizzle lightly with olive oil, sprinkle with pepper flakes and sugar, and season with salt and pepper. Bake for 50-60 minutes, carefully flipping the slices halfway through baking, until roasted and slightly browned. Transfer the tomatoes to a plate lined with paper towels, layering if needed. Refrigerate at least a few hours to drain excess liquid from the tomatoes. 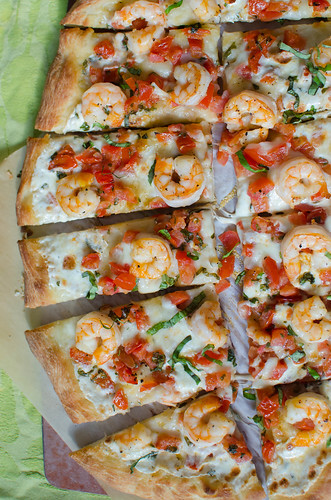 The tomatoes can be prepared the night before you plan to make the pizza to save time when cooking the day of. In a small skillet, combine 2 tablespoons of the olive oil with the garlic and red pepper flakes. Cook over low heat for about 10-15 minutes to infuse the oil with the flavors of the spices. Remove from heat and set aside. In a medium skillet, heat the remaining 2 teaspoons of oil over medium-high heat. Add the kale to the pan and cook, stirring occasionally, just until the leaves are wilted, 2-4 minutes. Remove from the heat and set aside. 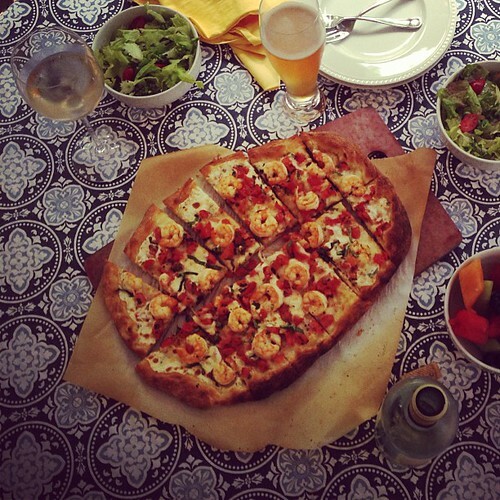 To make the pizza, preheat the oven (with a pizza stone or baking sheet inside) to 500˚ F for at least 30 minutes. Dust a large piece of parchment paper with cornmeal, and pull and stretch the pizza dough into a 12-14 inch round or oval. Lightly brush the dough with the garlic-red pepper oil. Spread the kale over the dough, then sprinkle with mozzarella. Arrange the tomatoes in a single layer over the mozzarella, and finally, sprinkle feta over the top. Using the parchment, transfer the pizza to the preheated pizza stone and bake until the cheese is melted and bubbling and the crust is lightly browned, about 10-12 minutes. Remove from the oven and allow to cool for about 10 minutes before slicing and serving.